That kaleidoscope watch face is great if you want to make it really hard (at times) to see the hands of the clock. Look at that watch face above. How long does it take you to figure out that it's approximately 3:48? 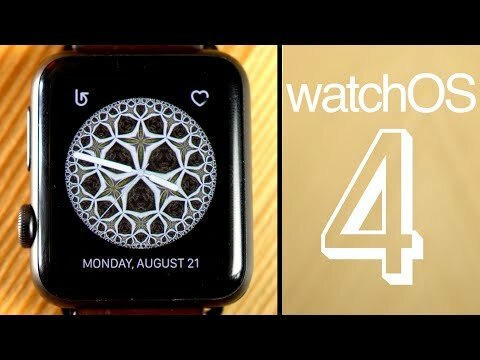 Be nice to have a Music watch face that enabled the crown to adjust volume. Especially useful with AirPods. I like both of those ideas. Frequently it takes me too long to adjust the volume on the Watch. First I have to wake the screen, either by raising or tapping, to see the watch face, then hit the side button, wait for the music interface to come to the front, hit the volume control button and then tap the + or the -. Having a music watch face with crown volume control could certainly cut back on that friction just to do something relatively simple. I was saying exactly this same thing yesterday in the thread about AirPods. Compare how easy it is to change the volume on a new MacBook Pro with touch bar compared to changing the volume of AirPods using an Apple Watch. Give me an intuitive no-look gesture and I'll be happy. actually, you don't have to force touch the screen to change watch faces. just swipe from the edge of the screen any side to switch to another watch face. works even now with watchos3. Yeah, and now am I constantly dealing with the watch face switcher pulling up by accident multiple times a day. Frustrating. My favorite feature is the improvements in the photo remote control. No, wait, what about the ability to receive payments? Or wait, make a call. They're all my favorite!!! I have not experienced this ever. The only time it happens to me is when I'm carrying my toddler and she starts playing with my Watch while it's on my wrist. It happens maybe a couple of times a week. She just sort of paws at the screen. Sometimes she changes faces, others she may put it in silent or ping my iPhone. Either way, it's trivial to undo what she's done. Improved battery life and better volume during phone conversations would be welcome additions. Thanks! That explains why different watch faces mysteriously keep showing up on my watch without my intentionally changing to them. Actually, my favorite improvement is not happening. I've wanted improved ability to set the display on the Workout app. Currently it only allows you to set how many parameters show up on the screen -- but all it does is eliminate those you don't want. But, if you select less than 5 it just leaves empty screen real estate. For active sports like running you need bigger fonts because you need to be able to pull in the information at a very quick glance. One of my apps, for instance, shows pace and distance in text but then changes the background color to indicate which heart rate zone I am in. And, if I want additional parameters I can swipe the screen over to show them. Unfortunately, it does not yet run natively on the watch and instead relies on interfacing the watch and phone -- so it's slow and clunky. Also, the Activity app looks like it will continue to be weak in reporting as all it does is show overall averages for things like pace, heart rate and elevation. It does break down pace by segment, but adding things like heart rate and elevation would be very helpful. In addition, graphing things like heart rate, pace, elevation, etc. would be extremely helpful. In short, for active sports like running, it seems like both the Exercise app on the watch and the Activity app on the phone were designed by geeks who learned about running but do not actually do it or understand it. For me, that is un-Apple like. I know they can do better. Minor nitpick -- the plural of code is "code", not "codes". Software code is a different use of the word than cryptology codes. What about audiobooks and podcasts syncing to the watch? In your video, there's a brief shot showing what looks to be a Dave Ramsey podcast on the Apple Watch. I think Apple should repurpose the function of the twiddly knob (AKA crown?) like they did for the side button. I never, ever use the time travel feature so let me use it for something else based on the selected watch face. For example, I (as a user) would probably default it to controlling my AirPod volume most of the time, but perhaps there are times when I'd want quick access to changing time zones. I just hope that everyone at Apple uses their Apple Watches every day and realize its current limitations and rough edges. I should be able to do more with fewer finicky taps. FYI the time travel feature was removed in watchOS 3. But yes, the crown could be more useful. I agree that defaulting to controlling the volume of currently-playing AirPods would be super useful. I have no doubt that the people at Apple use the Watch and continue to realize better ways to use it. After all, look at the improvements so far. We're getting a v4 that will run on my original hardware and has great new features. Can the same be said for the Samsung watches? Are they even still supported? In use? Time Travel wasn't removed, just sort of hidden. It needs to be turned on in the Clock settings in the Watch app on your iPhone. I would like a digital stopwatch with bigger characters. I am sure many senior citizens would like this feature. We don't need tenths or hundredths of a second. I have no doubt that the people at Apple use the Watch and continue to realize better ways to use it. After all, look at the improvements so far. We're getting a v4 that will run on my original hardware and has great new features. That's such an important point. We're still in the infancy of these wearables, learning as we go. The tech progresses, we learn more about how they're used and what they can do that's useful to us. We're still I think quite far from where we will settle in utility and functionality (and form factor) of these devices. Who knows what other functionality might be offloaded (or created anew) to the smart watch? It's quite a fun ride I think, especially if you've decided to jump in and embrace it. Can't wait to see where it goes.